Adjusting interior doors is something that need to be done periodically. The weight of the door pulls on the hinges and causes them to get out of alignment over time. Fortunately, adjusting the door is not too hard and only requires a few tools. Not sure if this is your problem? 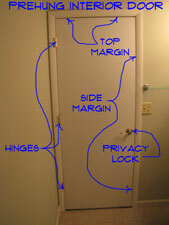 See the article, 'Troubleshooting Door Problems' for a complete listing of all the door topics. The first thing to do is look at the door from the inside when it is closed. There should be an even gap across the top and down the latch side. This gap occurs between the door and the frame or jamb. It should be about an eighth of an inch and be consistent. If the door is tight against the frame at the top and there is a gap at the bottom, the door is sagging. If the door is hitting the floor, it will still be indicated in the margin along the latch side. Is the gap wider at the bottom and narrower at the top? Yes, then the door is sagging. Open the door back up and remove the two inner screws for the top hinge. How long are they? An inch or less? This means that the hinge is only being supported by the door jamb itself, not the framing lumber for the wall. Are the screws long, say 2 ½ to 3 inches. That's good, all you will need to do is tighten them up. This prehung interior door repair could be that easy. More is not better in this situation. If you over tighten, the door will bind in another direction, meaning you will continue to need a prehung interior door repair. Tighten until the margins are even and the door closes easily and then stop. With the long screws in place you may have to snug them a little from time to time. Five minutes now that you know how. Door closes, Great! Go to the next project on your list. If you have long screws, make sure the heads are not stripped. For short screws you need to obtain some 3” number 8 screws. Square or Torx drive are better, but phillips head will work. Install the long screws, angling them slightly toward the center of the jamb. Snug them up and then check the margins again. Still sagging? Tighten them a quarter turn at a time until the margins are even and the door closes properly. The top hinge is the key to most door problems. Getting the door adjusted properly will solve many of the issues that you have.